(Somerville, MA) Walking past the Somerville Market Basket, down an alley to the right, I was unsure what to expect from Exiled Theatre’s production of Jean-Paul Sartre’s No Exit. To help set the mood, audience members were directed to “descend into Hell” (aka down a flight of stairs) into a basement space. Bulbs hung from the ceiling, and a modest but tasteful array of couches donned the scene—some were for the actors, some acted as seats for the audience. There was a great amount of effort to prepare the audience for what they were about to witness, and its effect made for a great welcoming. In Sartre’s No Exit, three newly deceased individuals, one man and two women, are escorted into a furnished living room in Hell. There are no mirrors, no windows, the door is locked, and the lights never turn off. The group discusses their lives, how they died, and why they believe they were sentenced to eternal damnation. In between conversations, visions of events that happen back on earth flash before them, further tormenting the trio. Vincent Cradeau (Matt Arnold) plummets into fury as he watches his former colleagues smear his name, calling him a coward. Inez Serrano (Rebecca Schneebaum) is horror-struck seeing her old apartment sold to a new, happy, heterosexual couple. And Estelle Delaunay (Olivia Caputo) mourns her life as a rich member of high society, witnessing her previous lover fall for another woman. Seeing how a show chooses to trap its characters is a great way to examine the thoughts of the playwright, and No Exit’s method proves Sartre’s genius. Not only are the three character stuck in a room, they’re also dead and in Hell—there is no escape, as the title aptly states. The simple cleverness of it is monumental. This setting allows the characters to slowly devolve and cast aside their gripes or intention to keep up appearances. What unfolds is a compelling and fascinating study of human nature that transcends existential thought. It’s a tough feat, but the cast pulls it off with aplomb. Arnold as businessperson Cradeau is determined, yet shows the softer vulnerability mixed with rage of the character nicely. Schneebaum is delicious as the ruthless Inez, able to flip back and forth between sweet flirtations and angry, unfiltered moments of passionate clarity, laying out everything as it is. She manages to keep Inez’s harsh edges without losing the disgusting likeability of the character. And as the vane socialite Estelle, Caputo manages to strike the biggest chord of sympathy from the audience, without guilt tripping anyone. At her rawest, she is an unhappy woman who needs to be validated by other people, and there is something beautifully honest in her desperation. Overall, the sensory effects in Exiled Theatre’s production were really nice. The lighting was simple, comprised of strings of holiday lights and four distinct bulbs that turned on or off in certain moments. In particular, the moment when the door is thrust open became exponentially impactful when a couple of these bulbs went out. It helped create a sense of mystery and fear in a small but powerful way. The one piece of the show that became bothersome was the repeated use of a loud humming sound whenever one of the characters was seeing a vision of life on earth. The repetition of the same noise, and at the same increasing volume, became mundane and expected, and I wished there could have been variations either in noise, frequency, or volume, to make each moment feel new in a subtle way. Exiled Theatre’s production of No Exit is an immersive and raw theatrical experience that speaks to the human animal in all of us. It dissects without stopping and invites the audience to be part of the conversation. Most importantly, it reminds us of our humanity, and how fragile it becomes when tested by other people. No Exit runs for 1 hour, 30 minutes with no intermission. To purchase tickets, click here. 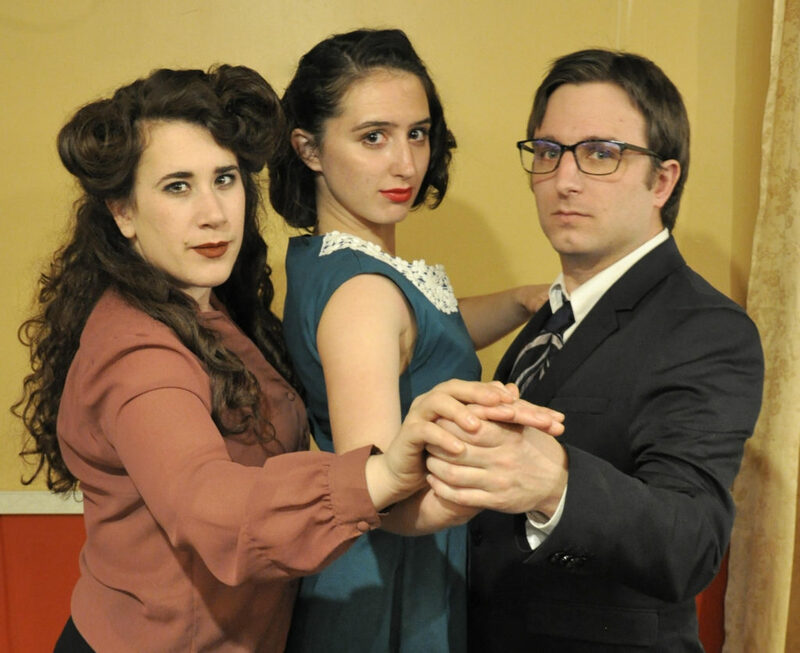 This entry was posted in Drama and tagged 2017, April, Exiled Theatre, Hell, Jean-Paul Sartre, Katharine Jordan, MA, Market Basket, Matt Arnold, No Exit, Olivia Caputo, Paul Bowles, Rebecca Schneebaum, Somerville, Teri Incampo, Travis Manni by Travis Manni. Bookmark the permalink.